SOLUTIONS FOR ALL YOUR ROOFING AND WEATHERPROOFING NEEDS. If you live here in Lunenburg, there’s only one crew you need to call for all of your roofing needs. We offer roofing installation, repair, and replacement services for all sorts of roofs, including both residential and commercial projects. We’ve been working on roofs throughout Central Massachusetts since 2012, and we’d be ecstatic to earn your business. 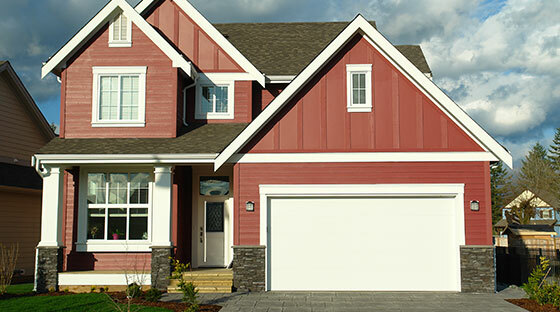 If you’re ready to ensure that the roof over your head is trustworthy, we’re here to help. Get started by reaching out to us to schedule an appointment. You can also learn more about our roofing installation, repairs, and replacements, the various materials that we work with, and some of the additional services that we provide — all of which are listed below. If you’ve built a new home or a new building, we can cap it off with a roof that will last for decades on end. We provide roofing installations for both sloped and low- or no-slope roofs, and we work with most materials in the industry (you can learn about our specific roofing materials below). We can also install insulation and weatherproofing, so you only have to call one contractor to complete your building. Need A Roof Repair Or Replacement? Contact Red Dog’s Roofing Today! Whether you have a flat roof that has sprung some leaks, or you have a sloped roof that has lost a few too many shingles, we can repair or replace your roof as necessary. Count on our professional roofers to take a look at the state of your roof — we’ll assess whether or not a replacement is necessary, and we’ll let you know about your options and we’ll provide a quote for our services. Then, of course, we’ll get to work right away, so that you can trust your property is protected before the next storm approaches. Give us a call if you’ve noticed that your roof is damaged, or if it’s time to schedule an inspection. From traditional asphalt shingles to luxury slate tiles, we work with all of the most popular roofing materials that you’ll find here in Massachusetts. Red Dog’s Roofing has partnered with Owens Corning®, one of the foremost providers of premier asphalt products. As a Preferred Roofing Contractor, we’re able to provide unparalleled warranties on both our workmanship and the performance of the shingles themselves, so you can rest assured that your roof will remain intact for years to come — and if a problem should occur, we’ll fix it. If you’re considering Owens Corning shingles, we can offer an exclusive warranty on both our installation and roof replacement services. Wood shakes look great, and they perform relatively well, even as a traditional building material. That said, shakes are far from impervious to damage, and they require special skills and tools for installations and repairs. If you need work done on your wood shake roof, or if you’d like to cap off your home with a beautiful cedar top, we provide repairs and installations. 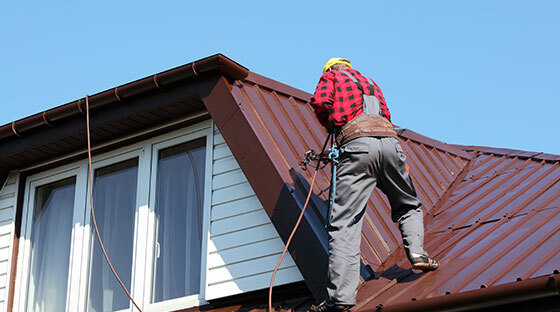 Metal roofing is a cost-effective, long-lasting roofing material, and it may be the ideal solution for your home or building. If you’d like us to install a new metal roof, we can perform the job in a matter of days (thanks to the ease of installation of this roofing type). 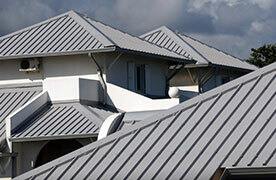 We also provide roof repairs, and we can replace individual metal sheets as necessary. 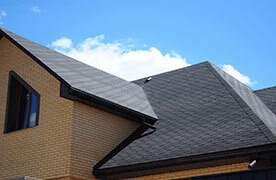 We also provide repairs for shingle roofs, and we’d be happy to replace any shingles that are damaged or missing. If you notice shingles that are cracked, torn, missing granules, discolored, or missing altogether, give us a call. We’ll take a look at your roof, and we’ll repair any areas that require attention. 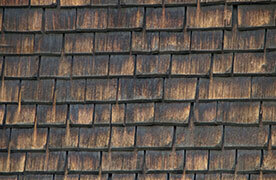 Like wood shake roofs, slate tile roofs require the proper tools and skills for repairs and installations. We can work on your roof if you have old chipped slate tiles, and we can install a new slate tile roof if your roofing structure is strong enough to support heavy slate (slate tile roofs are far heavier than any other roofing material, and as such, they require adequate structural support). If you’re looking for a roofing solution that looks great and lasts for decade after decade, then slate tile is the way to go. 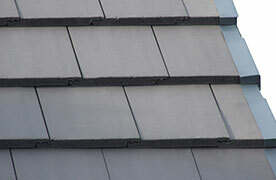 Composite slate is designed to look just like the real deal, yet it is far less expensive and far lighter. We can install and work on composite slate roofs, providing you with that luxurious look at a fraction of the price of authentic slate. 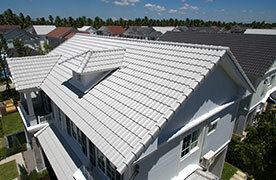 Want to learn more about the different types of residential roofing that we offer? Have questions or concerns about a repair job or installation? Contact Red Dog's Roofing today! As we mentioned, we don’t just work on residential roofs here in Lunenburg — we also provide roofing services for commercial buildings, including buildings with low- and no-slope roofs. We’re proud to offer a number of roofing installation and repair options, and we work with all of the following roof materials: TPO roofing, PVC roofing, rubber roofs, torch down roofs, modified bitumen roofing, and roof coating. Ensure that your business remains protected with a hardy roof from Red Dog’s Roofing. On top of our traditional roofing services, we also provide chimney services, roof snow removal services, weatherproofing services, and insulation installations. Feel free to learn more about our various additional services below. While we’re up on your roof, we’d be happy to take a look at your chimney to ensure that it is in tip-top shape. We can assess and repair any damage that your chimney may have endured over the years. We can tuckpoint and rebuild your chimney if your bricks or mortar are crumbling apart. 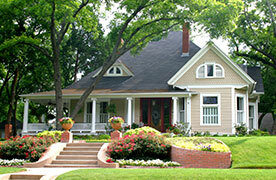 We can also repair and install chimney caps, flashing, and chimney crowns. You can be certain that your chimney won’t leak, and it will withstand storms and high winds. You can learn more about our chimney repair services. When winter rolls around, resident here in Lunenburg can be hit with mountains of snow. And unfortunately, that snow can wreak havoc on your roof. If you have several inches of snow on your roof, or if your roof is in danger of creating ice dams (which hold water and can cause damage and leaks), then you can call on us for roof snow removal. We’ll make sure that your roof makes it through this winter safe and sound. Feel free to read more about our roof snow removal services. Here at Red Dog’s Roofing, we take pride in making sure that our neighbors have a solid roof over their heads. If you live here in Lunenburg, then we’re the local roofing company that you can rely on for any and all of your roofing services. Reach out to us today to schedule an appointment for your upcoming project! ©2017 Red Dog Roofing LLC® - Do not copy mockup. All rights reserved.